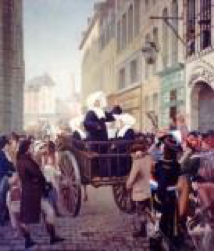 During the French Revolution in the late 1700s, a number of Daughters of Charity were among the hundreds of faithful priests, religious, and ordinary catholics who were killed because they would not take the oath required by the revolutionary government of France. This oath separated those who took it from the Catholic Church in Rome. June 26 is the feast day of these five Daughters of Charity who were guillotined by the revolutionary government. The focus here will be on the four Daughters of Charity from Arras who were martyred in 1794. 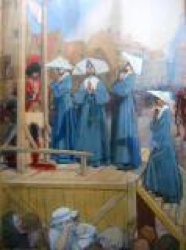 One other sister, Sister Marguerite Rutan, was guillotined in the city of Dax. The House of Charity at Arras was founded by St. Vincent de Paul and St. Louise de Marillac. The sisters served those in poverty with great zeal and creativity until the time of the French Revolution. 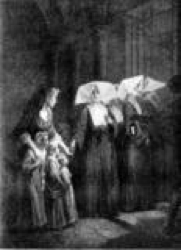 Seven Daughters of Charity were serving there, visiting those in need in their homes, providing a free school of girls, and serving the sick in a dispensary. Benefactors were generous, the sisters were esteemed, and the ministries were in a prosperous condition. to the Catholic religion. In 1789, the Motherhouse of the Vincentian Fathers and Brothers was pillaged. Superiors wrote to the sisters, encouraging them to remain faithful to the service of those in poverty for as long as possible, but to be willing to lay aside the habit in order to continue their service of love. In 1792, all religious congregations were suppressed by the government. The Motherhouse was transformed into a barrack for soldiers. A number of sisters returned to their families and some were helped to escape to Belgium. At Arras, four Daughters of Charity continued their service: Sister Madeleine Fontaine, local superior, age 71; Sister Mary Frances Lanel, age 48; Sister Theresa Madeleine Fantou, age 46; and Sister Jean Gerard, age 41. They were unwilling to take the oath and so they were arrested on February 14, 1794. Confined for several months to various prisons, they ministered to their fellow prisoners with great kindness. Then, they were summoned to the revolutionary tribunal in the town of Cambrai. On the road from the prison to the tribunal, they prayed, sang spiritual songs, and consoled the other prisoners, repeating several times that their blood would be the last shed at Cambrai. Their peace was remarkable on the way to the scaffold. They were guillotined, but the prophecy of Blessed Madeleine was fulfilled--they were the last to be executed at Cambrai. God rewarded their daily fidelity to His will with the extraordinary grace of martyrdom. They were beatified by the Church on June 13, 1920. May God also give us the wisdom to make good decisions about the situations that demand our response and the courage to embrace the daily sacrifices that are asked of us! Written by Sister Marjory Ann Baez, D.C.